The Alsung Complex is located in the mountains of Barangay Anagguan, Rizal, Cagayan. It is four (4) kilometers away from the Poblacion. It is a rolling terrain at 40° (elevation) at its peak. It can be reached by hiking or horseback riding. To reach the cave, you have to walk a trail along veldt, corn land and patch thickets and crisscross the Anagguan Brook. The complex is composed of the Alsung Cave with undetermined number of chambers with only eight (8) chambers explored or frequented by enthusiasts or spelunkers. Each chamber is full of glistening stalactites and stalagmites with numerous bats hanging from the ceiling. From the cave upward into the dense forest at 30° elevation about 500 meters away is the Bassao Falls. It is 30 meters more or less in height with water like cotton balls cascading from the top to the pool below. The pool is si pristine, cool and refreshing. A dip to the pool may sooth one’s perspiring body after the ascent. Before entering the complex is the Alsung Spring. Alsung is the Malaueg term for mortar. The source of the spring is mortar-mortar like hence the term Alsung was derived. The spring was developed and it is from here that potable water is drawn for the residents of Barangay Poblacion, Anagguan and Batu. All the way to the cave, you have to crisscross the Anagguan Brook, with its white stones and pebbles. Aside from the local residents and people from neighboring towns like Tuao, Piat and Solana who are collecting white pebbles and stones use them for landscaping, many people as far as Central Luzon are now buying these stones. The complex is within the declared National Integrated Protected Area System (NIPAS). It is inhabited with numerous fauna and flora. Aside from the above mentioned eco-tourism destinations, the municipality of Rizal have caves in Zinundungan Valley that were not yet explored by spelunkers but frequented by the locals who go on hunting. 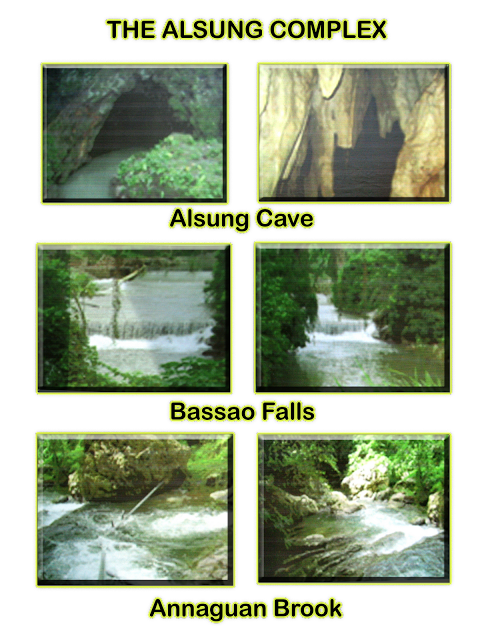 Rizal also have numerous waterfalls and hot springs like the one in Barangay San Juan, which the water smells like sulfur. When the National Road will be developed from Gaggubatan West to Lasam, the caves, hotsprings and waterfalls will also be developed, as they are good places for nature lovers. The mountains of Zinundungan Valley are rich with numerous fauna and flora. I like that town!!! It's really an environment friendly municipality and it has a lot of things that are awaited to be discovered!!! Adventure is also one of your vocabulary if you visit this town!